Villa with secluded large garden and pool. Reduction for 2 people in low season. Casa Do Capitao is an attractive two bedroom semi detached villa positioned at the end of a quiet cul-de-sac on a small development in Ferragudo and overlooks open countryside with views to the Monchique hills. Ferragudo is a charming old fishing village situated on the eastern side of the river Arade opposite the well-known resort of Praia da Rocha and the market town and marina of Portimão. Ferragudo offers everything for a relaxing holiday and has an historic central square and quaint cobbled alleyways. The village is very well positioned for shopping, golf, tennis, soft sand beaches and other places of interest and activities. There is a paved footpath from the villa that offers a short cut down to the village road with cafés, various eateries a general store and a chemist all less than a 5 minutes walk. A couple of minutes further along the village is the central square where you will find an ATM as well as many bars and restaurants. The lovely sand beach of Praia Grande is a 10 minute walk away. We bought this property in 2017 and have made a number of improvements already. Both bathrooms have been fully refurbished. The downstairs bathroom now has a walk-in shower and the upstairs bathroom has a bath and a walk-in shower. Both bedrooms have also been updated with new twin beds and the main bedroom now has a super-king bed. The property is completely fenced and gated and enjoys a large well tended and mature garden. There are lovely views to the Monchique hills in the distance. The villa has a beautiful blue tiled heated swimming pool. The villa is attractively and comfortably furnished and boasts some extras for visitors like air conditioning, pool heating, Wi-Fi with internet and TV reception, fitted mosquito nets and electric shutters. There are sun-beds with umbrellas and outside tables and chairs for 6 people. We have also added a traditional Portuguese bar-b-q. We recently completed our purchase of Casa Do Capitao in Ferragudo. We think the villa is quite unique in that it's within walking distance of both village centre and the beach yet enjoys a quiet secluded position with a large private garden and swimming pool. We liked it so much we persevered for more than two years to complete our purchase. We are Katy and Paul and we live in the Reading area in Berkshire. 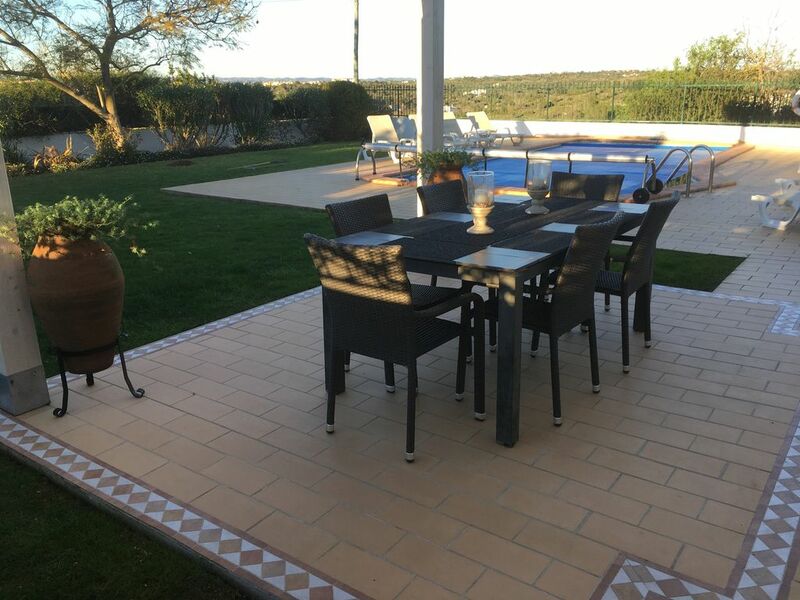 Our property manager is Rosemary Reynolds, she has been in the Algarve running a property management business for many years and she and her team are extremely professional and attentive. We hope you'll enjoy our home as much as we do! We love this villa because of its location and gardens. It's located in a very quiet corner of the small comlpex overlooking open countryside and onto the mountains, yet its an easy walk into town and to the beach. There is lots of outside space to enjoy both sun and shade and we just love the garden! Very quiet, beautiful views and a large secluded garden with pool. The large main bathroom is situated on the first floor between the 2 bedrooms. It has a bath, walk-in shower and heated towel rail. The smaller bathroom downstairs has a walk in shower and heated towel rail. There is a large parking area which is gated. The living room is divided into dining and sitting areas. The dining area has a table and chairs for 6, a CD and an MP3 player; the sitting area has 2 two-seater sofas and a satellite TV and DVD. Both have sliding French doors to the side garden. The modern fitted kitchen has an electric oven and glass hob with 4 burners, as well as a microwave. A large fridge/freezer and a dishwasher and washing machine. With local and English TV Channels. Local and a wide range on English channels. The large secluded garden is well maintained and offers plenty of space to find shade or allow the kids space to run around and play. The main bedroom has a large balcony with chairs. Golf is nearby. Gramacho and Vale da Pinta are a 10 minutes drive. Then within 30 minutes are Penina and Morgado to the west and Vale be Milho and Herdade dos Salgados etc to the east. The large secluded pool is 8 x 4 metres with a depth 1.50 metres. Heating is available on request. There is also a pool cover. We really enjoyed our 12 night stay in this lovely villa. We felt at home as soon as we arrived. The kitchen had everything you could possibly need, the beds were very comfortable and the spacious outdoor area was fantastic. We had hot and sunny weather the whole time, so we made full use of the pool and had several al fresco meals. We loved the fact that you can walk down into the village in less than 10 minutes. We ate at most of the restaurants and frequented a couple of the bars. We drove out to Burgau, Praia da Luz and Silves and also took the taxi ferry to Portimao. It felt like our own private ferry, as we were the only passengers on both the outward and return trips! We have stayed in many villas over the years, but this has been the best, mainly due to the secluded position, the lovely views and the general comfort. We are already in the process of booking for next year. Many thanks to Rosemary and Nicola for all their help. Great to hear you had wonderful holiday and enjoyed the villa. Thank you for booking again for next year and we hope you'll enjoy some of the further improvements that we'll be making over this winter. The property was really lovely and just what we needed. The grounds were beautiful and pool was great. It was in a great location as only a few minutes walk in to town and not far from the beach. Pleased to hear you enjoyed your holiday in Ferragudo and thank you for your kind review of our property Veta. Everything about our family stay here was ideal. There was excellent communication with our host Katy and the villa exceeded our expections. In a secluded location overlooking the hillside, this spacious villa was beautiful both inside and out. Very clean and well-equipped, Katy provided little touches to make it extremely welcoming. The large pool was inviting and well maintained and for beach lovers, a stunning beach was only short walk away. At the nearby town square and quayside you could eat out in a selection of restaurants (O Canto was fantastic) and take a picturesque water taxi to Portimao (or land taxi). We have already rebooked for next year at this great location. Can’t wait. Thank you Andrea. Glad you enjoyed our home as much as we do. ...it was my first visit to the property and having heard lots about it, my expectations were still exceeded. The property was in a quite cul de sac with gated parking. A spacious garden and pool area, which had views over fields towards to mountains and was not overlooked. Inside was as advertised and as already pointed out, exceeded the description given. It was an excellent location for my exploration of the Algarve, which has changed somewhat having last visited the area some 40 years ago, being central to both East and West days out. The town of Ferragudo, five minutes walk from the property, was unspoilt, quaint and there was lots to explore in respect of restaurants, bars and shops. The local beach was a ten minute walk with great views and a nice beach bar. I would HIGHLY recommend this place to stay and I will be booking again in 2019, love this place. Totally Impressed, what a find. The villa its self is fabulous, wonderful position with a huge garden and pool which could not be more private. Its owners have taken time and thought into its decoration as well. Its location in our opinion could not be bettered, its literally 5 mins walk into the fabulous square of Ferragudo with its range of resteraunts and bars, walk the other way for 7 mins and your onto one of the best beaches in the Algarve, Praia Grande. So pleased we found this gem, we will be back later this year. Fantastic villa, perfectly placed for a 5 minute walk into the pretty port of Ferraguda with its restaurants, bars and beaches. The new owners have already started to invest in the property and provided excellent guidance and recommendations for a fantastic 10 days. After a day out sight seeing the large pool is ideal for cooling down, and the outside seating area perfect for enjoying a BBQ. Cannot recommend this place highly enough! The nearest beach is Praia Grande, a lovely sand beach, which is a 10 minute walk away. There are several beach bars open for lunch and dinner. Faro Airport is a 45 minute drive away. We recommend car hire at this villa but adults and walkers could well be happy without one. Changeover Day: Flexible changeover day. Arrivals should not expect to enter the villa before 14:00 hours and departures must leave by 10:00 hours. These rules may be able to be relaxed but on application only please. Notes on prices: The rents above are per week in UK pounds for 3-4 people. Please apply for the rates for 2 people (except in the Peak season of 16 July to 27 August when there is no reduction). Pool heating is an extra £80 per week; a pre heat is £60. Air-conditioning is an extra £60 per week. Security/breakage deposit is £250 to pay in cash on arrival or by bank transfer before arrival.